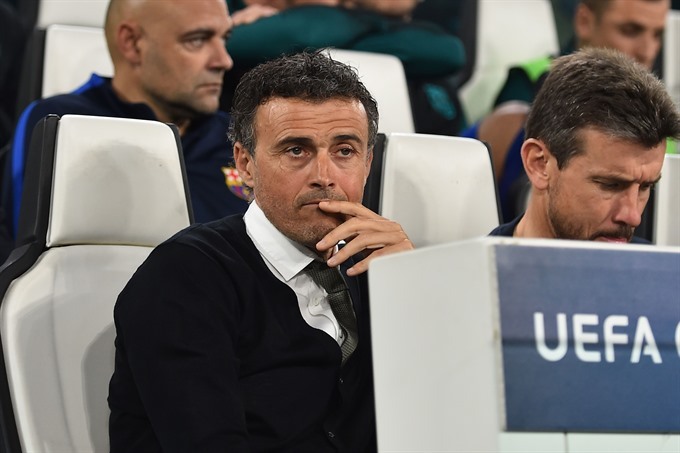 TURIN — Barcelona coach Luis Enrique slammed his under-performing players after a "nightmare" 3-0 loss to Juventus that has severely dented the Spanish giants’ Champions League hopes. A first-half double from Paulo Dybala and a second-half header from Giorgio Chiellini secured a quarter-final first-leg win for the hosts in Turin on Tuesday to leave Barca with a mountain to climb in the April 19 return leg. The Catalans will now require another epic comeback along the lines of that which saw them reach the last eight. In the last 16 they spectacularly overcame a 4-0 first-leg deficit to Paris Saint-Germain with a 6-1 win at the Camp Nou. But after seeing his front three of Lionel Messi, Luis Suarez and Neymar fail to fire against a far superior Juventus side, Luis Enrique voiced little hope of seeing another comeback next week. "We basically gifted two goals to Juventus in the opening half. As coach, for me it’s inexplicable how they were so much better than us," he said afterwards. He said the word "nightmare" no less than four times as he struggled to explain how Barca, who arrived in Turin on the back of a 2-0 league reverse to Malaga, failed to respond. And, in another pop at his players, he labelled their first-half performance in Turin the "third half" from their 4-0 defeat in Paris in February. "It’s like a nightmare. We’ve had very little luck of late, and now I can only hope that from tomorrow we get back on our feet. "In the first half the (Barca) players were determined, but we made the same mistakes from Paris, and that’s a problem." He added: "Our second half was much better. But I still have the opening half in my head, like a nightmare. "Maybe it wasn’t (a repeat of) Paris, but it was like the third half from Paris. "I’m an optimistic person. But I take responsibility for this. I’m the coach and the buck stops at me.